The Martin Yale CDS200 CD Insert Slitter makes creating high quality jewel case inserts for your CD’s and DVD’s easier than ever before. With a convenient tabletop design the CDS200 is designed to quickly and easily convert an 8.5″ x 11″ printed sheet into two CD jewel case inserts that are cut to fit inside a standard CD jewel case. The inserts will not only be cut to the correct size but will also be perforated along the two side folds to make them simple to separate and insert. With the CDS200 you can cut and perforate up to 4,200 inserts per hour making it an ideal solution for moderate to high volume CD production applications. The Martin Yale CDS200 is designed for organizations that create and duplicate CD’s on a regular basis. The CDS200 uses a two-step process for producing CD jewel case inserts. All the user has to do is simply insert a letter sized printed sheet into the bottom station and it will trim the left and right side of the document and cut the remaining portion in half, then take the two piece that were produced in the first step and run them through the top station to finish the trimming and to add the perforation. The CDS200 also features self-sharpening blades that are capable of operating for years without the need for replacement. If you have any questions or are interested in purchasing the Martin Yale CDS200 CD Tray Liner Slitter & Perforator, visit us at SpiralBinding.com. 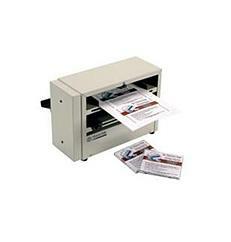 We have great pricing on a full line of Business Card Cutters. Call us at 1-800-631-3572 for more information!